Two arcade versions of Mach Rider were released. 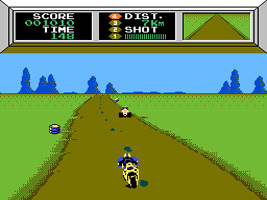 The Fighting Course version was released in Japan, and the Endurance Course version was released in the United States. Both version feature slightly higher speed and some new interim scenes. The Fighting Course version is based entirely around the Fighting Course in Mach Rider, you have to reach the goal with a limited number of lives while avoiding enemies and obstacles. Like in the home version, you can choose between two different paths before you start each race. The Endurance Course version is based entirely around the Endurance Course mode of the home game, you have to travel a certain distance within the time limit, while racing against enemies.